When one talks about tourist attractions of Vietnam, it will be deficient if not mentioning Phan Thiet – Mui Ne as one of the most beautiful destinations in Vietnam. They are despite small towns, the sense of exploration here is still on fire. Mui Ne (Mũi Né) is a coastal resort town located in Phan Thiet (Phan Thiết), the main city of Binh Thuan (Bình Thuận) province. It takes about 4 hours from Ho Chi Minh (Hồ Chí Minh) City by bus. Mui Ne is a tropical beach with greatly warm weather that is ideal for swimming and relaxing. Apart from going around the town and enjoying the scenes, beaches, and atmosphere here, witnessing the night sense of the darkness of this city and taking part in night activities will bring to you a unique experience. In this article, we would like to share some suggestions about Phan Thiet – Mui Ne nightlife that hopefully can help you plan a fulfilling trip to Phan Thiet – Mui Ne. 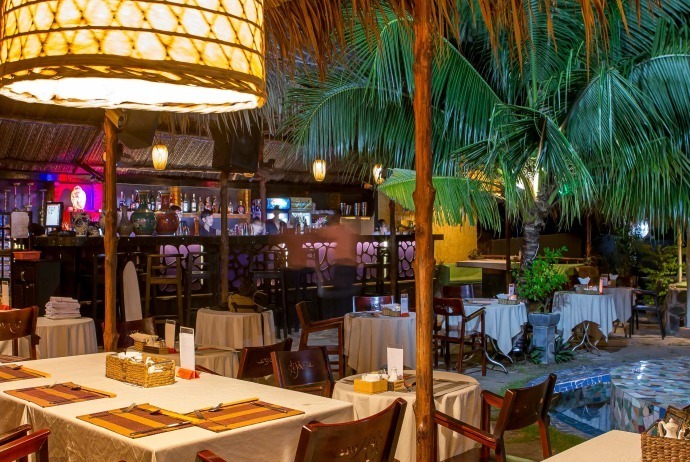 The first place we suggest you to visit when it comes to Phan Thiet – Mui Ne night life is the Pogo Bar and restaurant. This place is very suitable for couples who want to knit some romantic love stories. 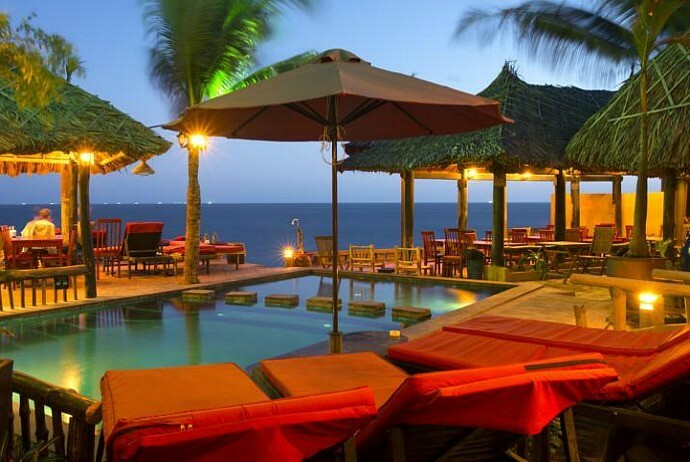 Many couples hang out in this bar, enjoying the night with cool breeze from the sea and ordering peculiar culinary. You can hear the sound of waves while listening to music – all create a rage of night harmony. This cozy place makes for a lovely spot where you could enjoy several hours away from the rush of busy touristy venues. Pogo Bar, Mui Ne could be best described as a beach bar. With the beautiful beachfront set up, Pogo Bar is among ideal places that tourists can experience the charm of Phan Thiet – Mui Ne nightlife. Besides, this bar is very suitable for those who are looking for a few relaxing hours amidst such a lovely ambiance. I bet that when you enter this bar, the first thing cross your mind is how people talk in this bar. The majority of guests here use Russian language to communicate, making it one of the most favorites of north European people to hang out when staying in Mui Ne. Champagne as well as liquor are very great. There are 5 seating areas in the bar that let you chose the best environment fitting your mood: a cozy art room with a pool table, a romantic rooftop hookah table below the stars, a tropical garden with the playground outside for children, an indoor area with the air conditioning as well as home terrarium, and an outside yard. From 12:00 to 16:00, the bar and restaurant features a three course meal that consists of soup, salad, a major dish with decoration and free cup of iced tea. The English-speaking staffs here are very proud to present a variety of cuisines, including seafood, Russian, Vietnamese, European dishes and even those exotic meats such as scorpion, crocodile and more. A large array of both new and old world wines is available for adult people and a special great menu for kids. The restaurant also hosts a variety of eclectic performances each Wednesday with the so-called name of Vietnam Night – a journey of spiritual values, traditional fashion and art of Vietnam and gastronomical diversity. Tuna, the owner of the bar and restaurant will greatly take the stage of guide guests through many centuries of Vietnamese lore. There are some great features of the nightly event in Déjà Vu bar and restaurant, which are the fire dragon dancing lion show, the Vietnamese costume fashion show, the kinetic ethnic drum performance, the stunt performance of Kung Fu masters, 9 dishes representing different specialties of Vietnam, national dancers and musicians, exotic liqueurs as well as sweets, and the event of pancake cooking. Furthermore, during Vietnam Night, all customers will be able to try on national costumes and take photos with the folklore heroes of Vietnam. You could buy tickets and book your desired table in advance in order to have smooth dining experience. 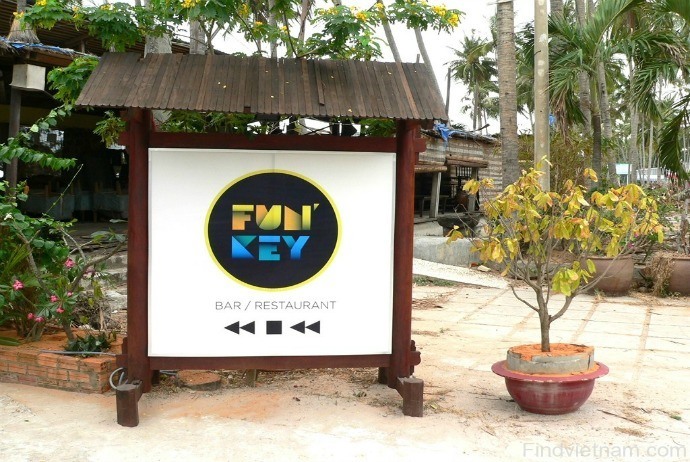 This bar is very perfect for those who are looking for a real night out in Mui Ne. The menu here offers guests both Vietnamese and western dishes, and also includes some delicacies like turtle, snake, and other dishes which you may not find at home. The top chefs here will make your meal unforgettable. In addition to the first-class, high quality food, this bar and restaurant also serves a variety of entertainment activities and facilities like games, a screen cinema, a play ground for kids, and even live music in the beautiful garden with seating corners in the back area of the restaurant. In order to complete the relaxing atmosphere, this bar and restaurant also offers shishas as well as different kinds of tobaccos, both foreign and local. Just come in and let the restaurant entertain you. Opening hours: 12:00 pm – 5 amThe reason why Fun Key Bar is presented in this list of suggestions for Phan Thiet – Mui Ne nightlife is its location right at the edge of Nguyen Dinh Chieu Street, which is very easy to recognize with the enlightened palm tree. This bar is ideal for guests to chill at late afternoon. After that, they could enjoy a great fun partner with good sound. If you feel hungry, you can make good waffle and crepes. Also, sandwiches here are great to taste. With free WiFi offer, swinging hammock right on the seaside, this bar is perfect place to relax after a day of discovering the island. The staff here is very nice and friendly. Located on Nguyen Dinh Chieu Street, right beside the tropic resort named Rach Dua, Wax Bar is an impressive destination for both locals and tourists to visit and relax in Phan Thiet – Mui Ne. By day, it is an empty spot for you to hang out in the shade, playing sand soccer, watching the kite surfers, and enjoying the waves. This bar becomes delightful at sundown, with pastel sky and pleasant breeze. Pillows, mats and torches are perfectly set out on the beach with a pleasant mixture of music. The bar is the most crowded after the night falls. Happy hours of the bar are usually from 6 pm to 7 pm and 9 pm to 10 pm. Sometimes, big beach parties are celebrated each weekend, drawing a large number of tourists to come. The price of food and beverages here are affordable. 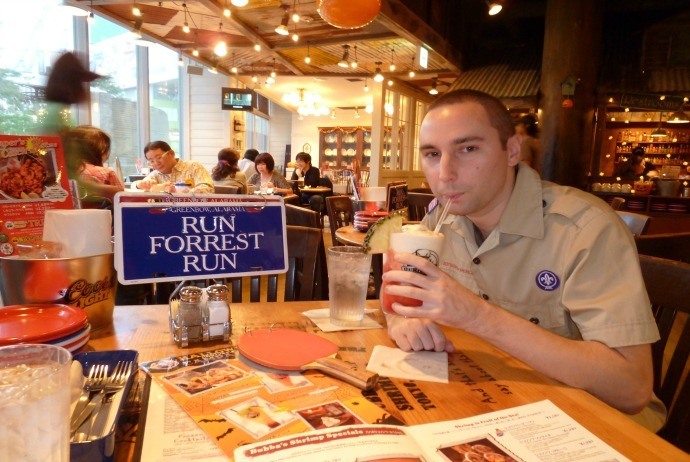 By paying a visit to this bar, you have a terrific chance of escaping from the busy life. This place should be taken in consideration if you want something different in terms of culture. To be honest, when getting there, you could spot some hippies, boho people who look like those travelers from different countries without purpose of eating or drinking but for the cultural purpose in this café. According to Patrick, the first impression of him when entering this place is rather nebulous with just spark of the LED green and orange lamp sparkling the space. 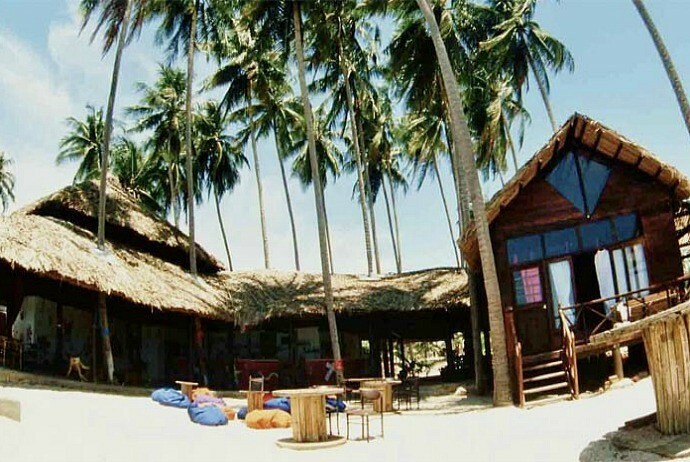 However, it is considered as the liveliest bar in Phan Thiet – Mui Ne. The lighting setting of the bar and restaurant is rather dim but create romantic but intimate pulse all over the place. The performers are Filipinos and many of their audiences are foreigners. Songs performed are various, ranging from Spanish, Russian, English to Tagalog songs. They dance to make the audience excitedly get up and dance as well. 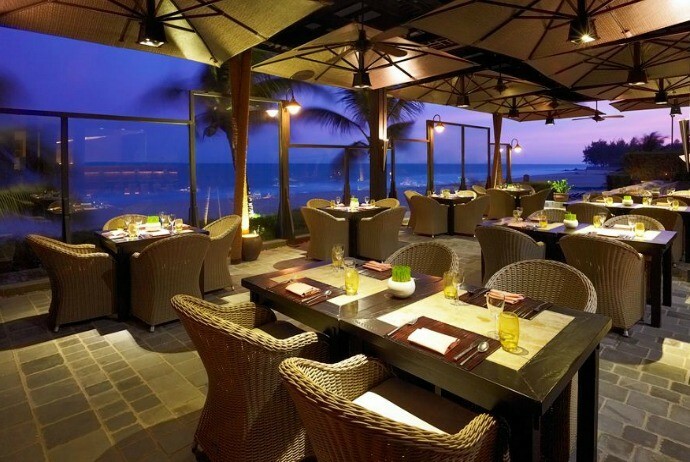 The reason making Joe’s Café Muine one of the must-visit destinations of Phan Thiet – Mui Ne nightlife is that it is a cool place for both locals and tourists to enjoy live music in a coastal excellent location. 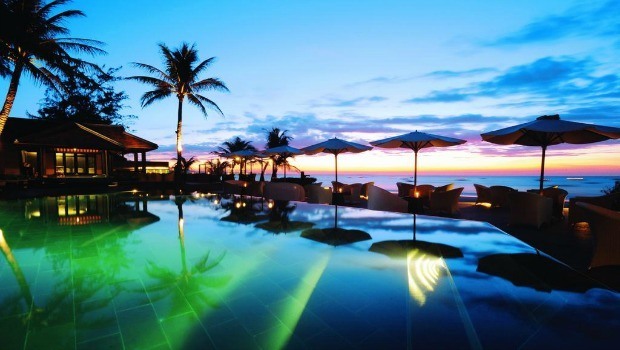 Another suggestion for discovering Phan Thiet – Mui Ne nightlife is to go to Dragon Beach Lounge and Club. If you love dancing in the beat of the DJ’s music, then this is definitely your choice. This exhilarate club has an extensive menu and services with pro bartenders. One more reason for visiting this entertaining spot is that its lighting set is impressive, not mention to its great location of beachfront. When blending inside this nightclub, you will be stimulated by the music here, keeping your head shake up and down and creating confusion between your ear and soul. In general, the circumstance of this bar and club is type of murky at the first glance, yet it will be soon beaten up when you see the green flashing along with bright lighting setup brilliantly installed inside. 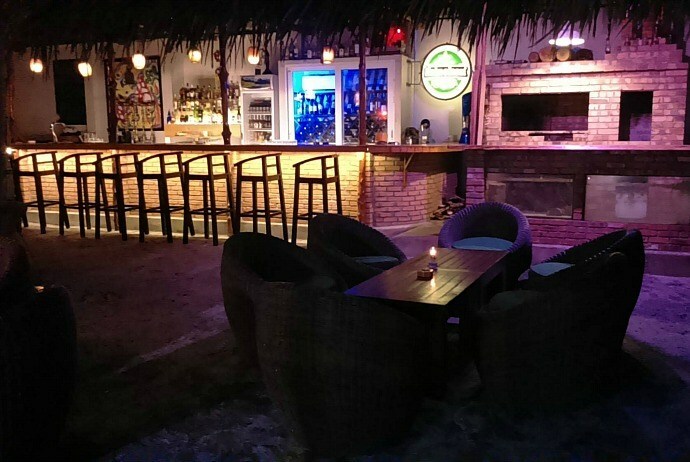 This newly built “underground bar” has the best beats in Mui Ne, with great live music each evening and a DJ playing funk, deep house, disco, and breaks. Replacing for the popular night site DJ Station, Line Up Bar And Grill is also as thriving as its predecessor that hosts a wide range of performances gathering artists from all around Vietnam. Some of the best DJ from Saigon come here and play styles from Tech House to Dup Step and everything in between. 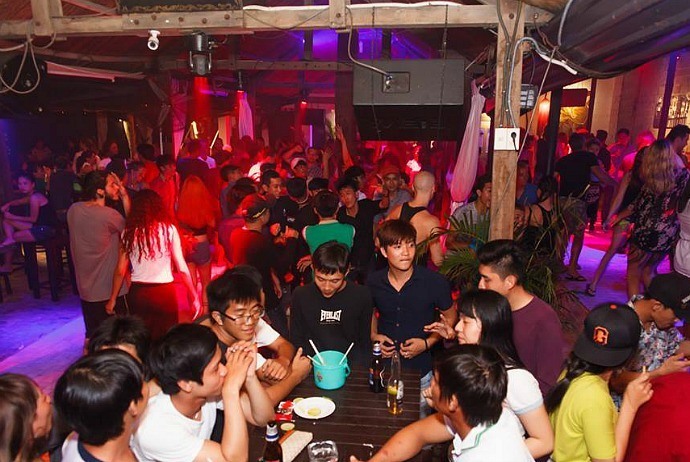 With a solid sound system, parties, showgirls, a wide array of shishas, a fire show, draft beer and other drinks, great location and above all, friendly and creative owners, this is reckoned one of the hottest sites regarding Phan Thiet – Mui Ne nightlife. Furthermore, the grill served here is very famous among locals and backpackers. The grill itself is open till 3 am and serves tasty BBQ, Argentinean and American food. There is a valet and parking service and this venue also takes bookings. It is a great destination for parties, opens 24/7. A top tip for first time visitors when going to Line Up Bar And Grill is to get there early for taking advantage of a sun downer meal deal, including an ice cold beer and the daily changing meal of the day. Do you want to taste something different other than techno music that swarms into your ears? This nightclub may give you all what you need. Hell’s Bell Nightclub stands out for its country music or rock genres played inside the club. A remembrance of something belonged to Western, right? Located on Nguyen Dinh Chieu Street, Snow club is a spot which will make your Phan Thiet – Mui Ne nightlife experience more memorable due to its comfortable atmosphere of lounge bar, great, mood-lifting cocktail, free pool and evening cinema-sessions. Known as the best bar with professional bartender who could create drinks according to special orders in Phan Thiet – Mui Ne, Snow Bar also offers free WiFi, free transfer from taxi Mai Linh to the bar and back to the hotel. There is no bar doing it for guests. Besides, staffs are friendly and attentive, and ready to serve customers from 10 am to 2 am. If you are about to visit Vietnam but don’t know what to visit for the best experiences, don’t forget adding Phan Thiet – Mui Ne to your site list. Upon visiting this destination, not experiencing Phu Quoc nightlife means that you have just missed out one of the most unique features of this place. Despite Phan Thiet – Mui Ne is not as dynamic and busy as big cities of Vietnam like Hanoi (Hà Nội) and Saigon (Sài Gòn), it still features its own special things that cannot be found in anywhere else. So, go ahead and enjoy your trip there! Due to the limited frame of this article, we just can list down some of the most impressive spots for tourists to visit at night in Phan Thiet. If you have any ideas to contribute to this entry, feel free to drop your words below.